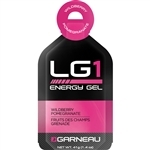 LG Energy Gel is made with natural ingredients and an optimum blend of carbohydrates, electrolytes and antioxidants needed to meet the nutritional demands of athletes during racing and training. The packaging is designed for a quick, no-struggle opening on the bike or during the run with a hole-punched tab for fingers to grip. LG1 Sports Drink is a blend of natural sugars from fruit, Vitamin C and extremely concentrated mineral salts that ensure optimal hydration and maximal absorption of carbohydrates for improved performances.